I ran config:cache in my Laravel 5.2 application and this error started showing up. I looked for many solutions. Nothing worked for me. I deleted extra packages from my composer.json and ran composer update. I ran php artisan clear compiled many times. I looked for errors in my files but could not find any. I also enabled the mysql extension since I found it somewhere. Then I did a fresh checkout of Laravel 5.2 and now the error is like this. So, it's not a problem of any config file of mine. Its something else. Any of you have any idea? Ok , so I solved it. Looks liek I had multiple issues. 'composer update --no-scripts' , then 'composer update'. That solved the issue. I also had to enable my mysql extension by editing php.ini file. 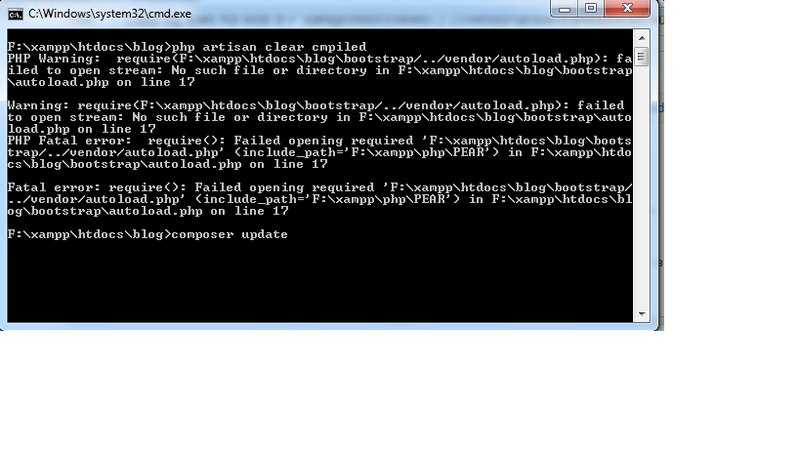 Finally, in my existing project, I actually found a problem in config/app.php. I missed a ',' somewhere. And people, laravel is a disgusting debugger. I miss my cakephp more. I am currently trying to clone an existing project of mine from github. After clone I run composer install during the process I receive the following error: Uncaught ReflectionException: Class log does not exist I am running Laravel 5.2 on Centos 7.